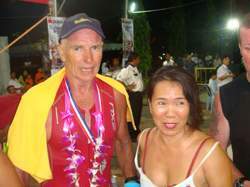 The famous, world-known Iron Man contest may take place again this year in Langkawi. When it happens, Paul Penders Co sponsors again 57 year old New Zealander Leslie McMillan. Leslie will be for up to 13 hours being exposed to torture under a burning tropical sun. And believe me, no peanuts to undergo such harsh tropical sun conditions hitting your body when one is in a survival mode during this race with the great obstructions. The rainforest island of Langkawi Geopark in Malaysia is located 5 degrees north of the equator with weather temperatures at this time of the year varying from 30 to 35 degrees C or 100 degrees F – that during the entire day! It is obvious that a whole day in the sun means an enormous attack on the skin. Sunburn and dry skin would be inevitable if adequate protection would not be taken very serious. Therefore a wonderful opportunity for Paul Penders to perform R&D tests during this race. Where in the world to find better conditions to measure efficacy of our products? 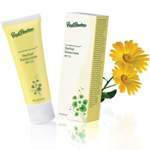 To know for sure how far our natural products can go in protecting skin and hair in a grueling sun? Any R&D scientist would dream to test his products this way. No lab tests in artificial conditions with computers for performance tests. No, this is the real thing in hot sun and salt seawater; thus extensive scalp and hair protection is a must. 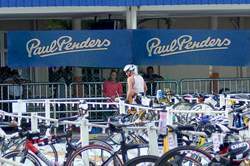 What Paul Penders products will be used during the race, as well during training sessions prior to the race? Most important: sun protection! Herbal Sunscreen SPF22 will be used to protect Leslie’s face, arms, hands and legs. But before Herbal Sunscreen a thick layer of Aloe & Lavender A.M. Moisturizer is applied to preserve skin’s natural moisture level. Each time after washing hair with Time-Release Jasmine Shampoo, followed with an application of Holy Basil Conditioning Scalp Toner to ensure balance of sun-damaged hair. Ceramide Recovery Lipo A, C & E will be applied as a natural skin rescue treatment to retain skin’s smooth appearance. Leslie, as well as us, were quite satisfied with the protecting effects that our products offered last time. Think about this… Just a 30-minute walk in the burning sun here in Malaysia will make one totally wet and exhausted. So imagine the effect on the body when one is for 13 hours constantly swimming, biking and running? Of course, only Leslie can share the details of the experience of fighting the elements. This will be covered in an exclusive interview after the race. With over 700 Iron Man competing, Leslie may not win but for sure will be one of the best protected contestants when it comes to professional natural skin and hair care products. Note: Each Langkawi Iron Man Race receives some 700 participants from up to 40 countries with over 1,500 volunteers helping out. Why Sponsor an Iron Man? 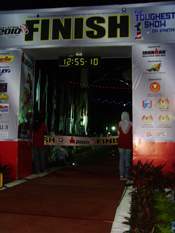 I would like to say few a words after the finish of the 11th Ironman race in Langkawi UNESCO Geopark. 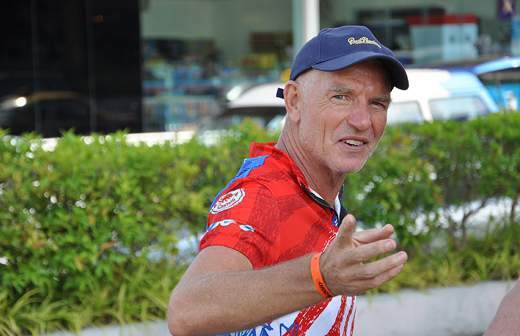 For the second time, we proudly sponsored Leslie McMillan, the 55 year old hero from New Zealand. I would like to explain why we sponsor this. Why do we for example not sponsor an event that has impact on natural cosmetics? First, I have to bring up that we sponsor other things as well… like the vegetarian restaurant in Kuah Town, Langkawi, where everyone short of money can eat a free, delicious and healthy vegetarian meal, cooked the Buddhist way. The only contribution required is to wash your own plate afterwards! We also pay for eye operations for blind children in China, enabling the children to see and live a normal life again. When the tsunami-disaster happened 5 years ago, we were the first company – one day after the tsunami hit the island – to donate a sizeable sum for relief to the local mosque. So why sponsor Leslie as well? We do it because we believe in the human spirit. Here we have one of the gentlest persons imaginable. A person, who is going to the extremes to test his body and spirit. Several younger men had to drop out of this race (including last year’s winner…), but Leslie continued! At the age of 55, he sets an example by stating that life is not over at 55. Heck no – he will be doing this till he is 65 or till whatever age, before he decides to stop. 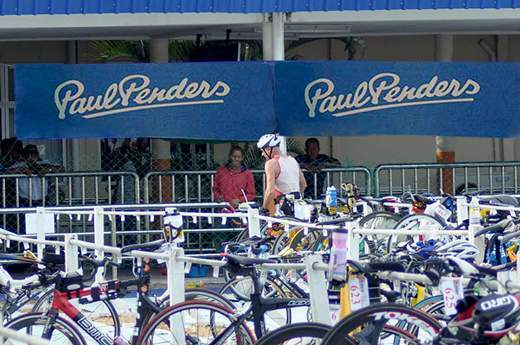 Meanwhile, during training and during this unforgettable Ironman race, he tests Paul Penders products. Others finished the race with sunburned skin – but not so with Leslie! 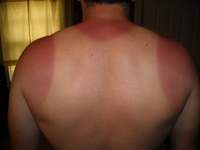 And not so with Paul Penders customers, who uses the same sun protection. Because Paul Penders products has been tested – in practice. By someone like Leslie. Making sure the products hold up, even in extreme weather and sporting conditions. Lastly, Leslie is one of my favorite people here on the island. Wherever he goes, he is received well. He is naturally kind and good-humoured! There is always a positive word to others from Leslie. He even encouraged his competitors in the race not to give up, while at the same time being close to exhaustion himself. People like Leslie are for sure hard to find. For that, we love Leslie. Paul Penders Co proudly sponsors this very special Iron Man! 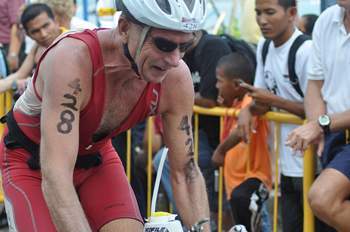 Today, the second and last part of the Iron Man, Leslie McMillan’s fascinating story from last Saturday’s Langkawi Ironman race continues. (Read the first part here). My transition from swim to bike took just over 4 minutes, and, before I knew, I was heading out on the road, riding my beloved Cervelo p3.The bike-leg is my strong point, and I covered the 180 km feeling comfortable at all times. I worked hard on keeping up my hydration and food. I have an alarm that reminds me every ten minutes to take in nutrition. While I was lucky on the bike, I felt sad for the four cyclists I witnessed with punctured tires, looking despondent on the side of the road. There were also a number of accidents between cyclists and vehicles. Having knowledge of local driving habits, I always kept a careful watch out for unpredictable drivers. I finished the bike course in 6 hours and 1 minute, the same as last year, and the time I had targeted for. Transition from bike to run was around 7 minutes – a little slow, as I fiddled with my sports watch, a Garmin Forerunner, trying to reset it to run mode. My run started well with none of the painful stomach cramps that plagued me at the start of last year’s race. However, this is where the story takes a turn for the worse as I headed on – oblivious to what lay ahead – right into what I called “the perfect storm”. The weather was to be the major contributing factor that changed my race strategy. Up till mid-afternoon, the weather had been favorable on the bike course, but then it turned hot and humid. The major part of the run course became a 40 degree (104 F) heat trap with no wind, no shade and an unfinished stretch of highway full of dust and fresh tarmac, radiating up intolerable temperatures. The description may be a personal observation of how I was experiencing these conditions, but it certainly was what seemed to be the major contributing factor to a really tough marathon for the majority of participants, resulting in much slower race times than planned. There was a lot of people walking, and the ambulances seemed to be up and down the highway, sirens wailing. No doubt tending to heat stroke or dehydration casualties. I struggled during the first half of the 42 km distance, and found myself constantly in a state of heat stress and constant thirst. Jogging was at times difficult, and I was forced to walk – often just to bring my heart rate under control and my body temperature down. A few times, I just stopped and sat down on the road, wondering if I could go on. Well, I did .Taking small chunks of the course at a time, one lap turned into two and, by the end of the third lap, the sun had gone down. With cooler temperatures, I was able to settle an extremely upset stomach, coursed by heat and excess fluid intake. Taking in some energy gels lifted my energy. I jogged consistently the last two laps, but the heat had taken its toll, and I was not able to pick up the pace. Finally, after 6 hours and 10 minutes – my slowest marathon yet – I arrived at the finish line. It was over, and I was elated that I had survived and finished my toughest Ironman race yet. My official time of 14 hours 11 minutes 42 seconds was slower than last year, but I felt that I had achieved so much more in overcoming the difficulties experienced during the marathon. 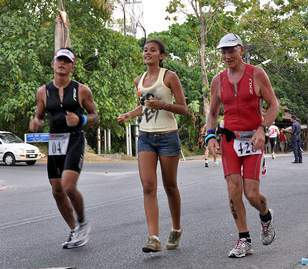 The Ironman is a tough event, particularly in Langkawi where – as we found out – the weather can make or break you. For the record approximately 536 athletes started the race and 115 did not finish. Nine of these were professionals, including last year’s winner. My overall placing was 255, and I placed 9th in my age group. I am quite happy with that. Thank you to my family, my friends, and to all who supported me. Special thanks to all at Paul Penders for helping me make this happen. I hope to continue. There are more Ironman races in me yet. 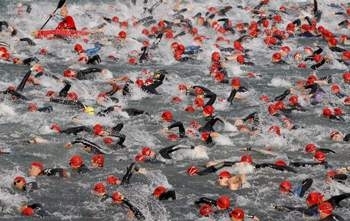 In the future I will challenge myself in Ironman New Zealand. 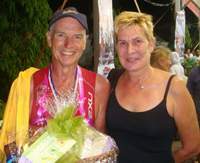 Leslie McMillan, the 55 year old New Zealander sponsored by Paul Penders, completed his third consecutive Ironman on Langkawi island in Malaysia last Saturday. Leslie was sponsored by Paul Penders. Everything was done to protect his skin, body and hair during the race. Read here how to be protected in extreme weather conditions. The story of his race experiences this year is a story of fight and struggle, about pain and agony, about weather conditions close to being inhuman, and about the change between fear and hope. In other words; it is a fascinating story, no matter if you like sport or not. It is the story of winning – not the race, but winning one’s own inner fight. Here are the first of two parts of Leslie’s fascinating experience – as told by Leslie himself. Last Saturday’s event was just as exciting as the previous two and I felt I had trained well for what lay ahead. My day started early as it was necessary to rise at 4 AM to eat a good breakfast that would allow adequate digestion prior to the race start at 7.45 AM. I arrived at the race venue about 6 AM, and there was a buzz of excitement as everyone prepared themselves for the long day ahead. Bicycle tires had to be inflated correctly, food and drink supplies loaded on to the bike, and, of course, a few quiet moments to just relax and focus the mind. After the professionals started at 7.30 AM sharp, I made my way into the water with a plan to stay to the far side of the course, and avoid the congestion of some 500 other swimmers who tended to favor the inside and middle part of the course. It can get a little brutal out there in the excitement of the start; swimmers can get in your way and can even come to blows. I had planned to swim slowly towards the start line at the two minute countdown, so I would be moving across the line when the gun went off at 7.45 AM. Unfortunately, the local dignitary entrusted to fire the starting pistol proceeded to fire it prematurely, and I was left some 50 meters short of the line. Many others were in the same predicament. My swim went well, and I managed to have plenty of space to myself, only getting caught up with diagonal swimmers a couple of times. I don’t mean that term in a derogatory way, but many swimmers only train in a pool, and have difficulties holding a straight line. It can be frustrating having them banging into you. I swim straight, because I only train in the ocean. 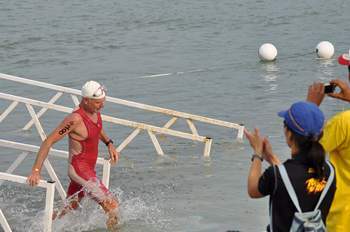 It was a hard swim out to the turning point at halfway distance of 1.9 km. Everyone had to battle a strong incoming tide that was not present in the previous year’s race. I remember looking out to my right and seeing a marker saying I had only covered 600 meters. It felt like I had already been swimming a considerable time. The return leg was much easier, and I exited the water after the 3.8 km feeling strong. My time for the swim was 1 hour and 31 minutes, around 15 minutes slower than last year’s .This was OK because, due to the strong tide, it seemed many competitors had a similar story of slower swim times. Little did he know he was headed for something far more turbulent! 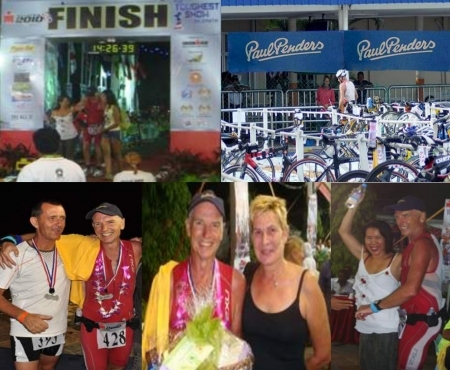 As usual, Paul Penders staff gathered on the evening of Langkawi Ironman, joining each other at the finishing line, eagerly awaiting our sponsored New Zealander Leslie McMillan to reach the goal line. It is always nearly impossible to predict when an Iron Man will reach the finish. There are so many factors to consider. How has the weather affected him during the race, has he been hit by dehydration under way, had cramps, had a flat tire during the biking, or who knows what else could have happened? Being at the event live is not at all like watching it on TV. No list of leading runners, no mentioning of those who might have given up under way, and no prediction of when they are expected to finish. Being there live is a completely different experience. First of all, there is the atmosphere. You do not get that on TV. Not at all. Being there means you have everything around you. The joy and relief when a runner reaches goal, the agony felt by those who managed to finish, though they seem like they had long time given it up. Only the willpower drove them to finish. Being a sponsor means you have the possibility to go backstage, among the photographers, the officials, and the anxious family members, whose worries suddenly turn into extreme joy and cheers, when their loved one cross the finish line. This is where Paul Penders staff gathered on Saturday evening. The weather forecast had promised temperatures around 86 F (30 C) all day. Whoever made that forecast was wrong! The maximum temperature reached 92 F (33 C), and it was very humid. 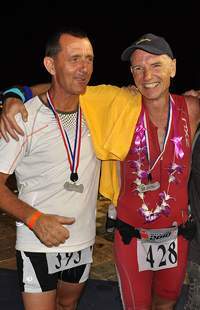 Finally, it happened: After swimming 2.4 miles (3.9 km), biking 112 miles (180 km), and running 26.2 miles (42.2 km) Leslie McMillan, the 55 years old New Zealander, sponsored by Paul Penders, was announced on the loudspeaker, and a few seconds later he crossed the goal line, hand in hand with his wife Jackie. No matter how much I try, I will never be able to describe the look of completely exhaustion, mixed with the feeling of extreme happiness, relief, and satisfaction. But that was how Leslie looked. If auras exist, this was how his aura looked; it glowed and shined around him. Leslie quickly headed on to the dressing room areas for some well deserved massage and a shower. On the way, he had the energy to promise an interview later, “a story of pain”, as he expressed it. As usual, we will leave Leslie alone for a couple of days; he really needs time to recover and restitute himself. But he did look like a very happy man. Depending on Leslie, we will bring the interview on Thursday or Friday.